Mental models battles are raging between the mass media model grounded in legacy print and broadcast technologies and the inherently digital model rooted in interpersonal communication. 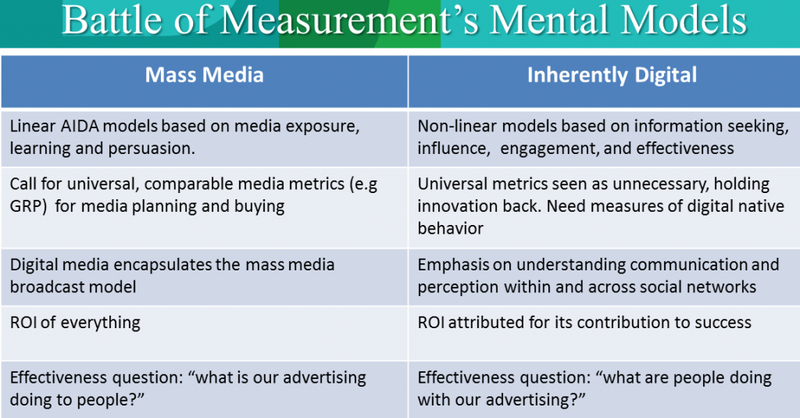 How this plays out will decide measurement’s future. Mental models explain how the world works. Each of us hold a variety of mental models for all sorts of things. Those of us working in marketing, media and advertising draw upon mental models that guide us in how we create communication, what we expect communication to do, and how we know if communication is working and effective. This chart lays out the differences. It comes from presentations I give on digital measurement. (c) 2014. Stephen D, Rappaport. All rights reserved.